There’s always a story behind what inspires bloggers to write specific posts. Maybe it is me? But often the story behind the post is just as intriguing and fascinating as the post. So I thought you might be interested in the story behind A Twitteraholic’s Guide to tweets, hashtags, and all things Twitter? Being at a large conference like ISTE, where you have over 13,000 people attending, reminded me of how much my life has changed as a result of using twitter. Life before Twitter at a conference was like the first day at a new school — really lonely, isolating experience and take days to connect with others. While life with Twitter at a conference is like walking into a big party where you know everyone and are meeting up with old friends. And it’s probably even harder to understand for those that don’t use twitter (or only use it a bit) but often we haven’t even connected with each other online before the conference. But Twitter brings us together — regardless of whether we’ve already built a relationship online. And the time we spend together face-to-face enhances our online relationships so the next time we meet up its even better! Connecting with others was as simple as sending tweets like ‘Who wants to go out for dinner #iste10’, ‘Who wants to go out for breakfast — I’m hungry #iste10’, ‘Where is everyone? #iste10’ or monitoring the hashtag #iste10 to find out what was happening. What other technology really allows you to connect with some many people so quickly? Off course there is often stories behind specific lines within a post. 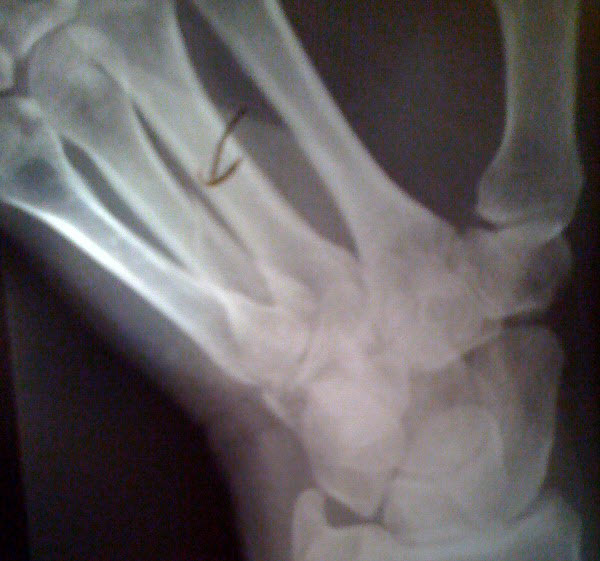 The day I flew out to USA I crashed my car — managing to break the suspension underneath my car and damage my left hand. Unfortunately due to travel commitments I couldn’t get my hand x-rayed until I returned home 3 1/2 weeks later. So while it was being x-rayed I tried to explain why there had been a delay in getting it done due to traveling as part of my work. Explaining what it meant to support a blogging company wasn’t working — so I tried the opposite approach by saying blogging is sort of like Twitter since most people have heard of twitter. That’s when he replied “Twitter is for people with too much time on their hands” — we’ve all had others say exactly that to us. For me it was we have to that line in the post because too often that is exactly what people think and say to us! And since I had managed to break my hand in the car crash I can confirm true crazy Twitteraholics don’t let things like a broken hand get in our way of tweeting or writing blog posts. Here’s the x-ray and my story remains that the concrete pillar was driving on the wrong side of the road! And back to “using it like a big teachers lunch room that’s open 24/7” — someone on tweeted that on Twitter during the time I was writing the post. Thanks whoever tweeted it! Hope my story has added more meaning to my A Twitteraholic’s Guide to tweets, hashtags, and all things Twitter? post and makes it as memorable for you as it was for me — especially considering it was written over at least week and from two countries at opposite sides of the World. And would love to hear the stories behind what inspired you to write your different posts! What would YOU like me to do a Presentation on? What a great post! I too had several fun Twitter stories that I blogged about at ISTSE 2010: http://tinyurl.com/285e5ll In one of them you played a rather influential role, if you remember! Even using Twitter for about 3 years, I’m still amazed how, like at a conference like ISTE, you connect, meet like-minded educators and start interesting and meaningful conversations that continue long after the conference has ended. @John definitely remember and it was soooo funny. What I find amazing is the fact that often the people you connect with at the conference via twitter aren’t necessary people you have already been networking with online but that you still have this common ground to base friendships on. Which as you say live on long after the conference ends. I have been a shy person pretty much since childhood, but life and circumstances have required that I put myself out there more and more. I still don’t like it but with blogging, I can put something of myself out for the world to read and reflect on and over time, it gets easier. I started pretty slowly with a small audience in mind – parents and families of students. Usually that’s just a weekly newsletter, but over time I have taken more risks and written some posts on more of my experience and thinking about life and tech. I now use my blog as a place for review, reflection, and sharing. I wouldn’t be able to do that speaking in a face to face situation, but writing online gives me more ease and freedom. Lately, I am getting a little sense of when a blog post topic is developing. It’s a new way of looking at life. Pretty cool! @Gail Thanks for sharing. I know of so many people like yourself that have said exactly the same thing about blogging and how it opens you to express yourself in ways you can’t face-to-face. I definitely a post you should write because I would it helps educators appreciate how blogging with shy students can give them an avenue to express themselves more. Sort of the same reason why I write posts to say that I’ve struggle with language all my life but blogging has helped me with these skills. Thanks for the encouragement Sue. I will reflect a bit more and then share my own growth in blogging experience. It can certainly be helpful to others who think there’s a big bad world of experts out there ready to shoot down their ideas. My experience has been quite different, in fact, I have received more support than I expected and developed a nice online group of friends. @Gail P Interesting enough most people are more concerned by putting themselves out there with comments then writing posts. Guess it is the whole on your own blog you can edit and remove content. @Darren Yeah you wouldn’t be alone. It was only if you watched really closely when I had to do specific tasks that you would go …. that is weird how she is struggling. By Denver I had got really good at working out what I could and couldn’t do – so adapted. I knew it was broken because I had that extricating pain you get when you do the wrong movement with a broken bone. I will never forget that pain as I broken my arm when I was a kid and my mum didn’t believe me. Being on holidays and 2 hours from the closest x-ray facility she decided it wasn’t broken and we would get it checked when we got home in 6 weeks. Thanks Julie for sharing the link – will definitely check it out! LOL at the concrete pillar was driving on the wrong side of the road! I remember one particular post inspiration after I had accepted a mid-year promotion to Vice Principal. I finshed my year off cautiously posting on my blog, thinking about how I had to be more careful & ‘bite my tongue’ publicly in my new ‘more responsible’ role. Then about a week before school started again in September of the following school year I was at a small lake with my family and I went for a swim. I decided I’d swim across the lake and on that swim I thought of how much my position changed my voice on my personal blog. On the swim back I wrote a post in my head called ‘Beg for Forgiveness’ which really paved the way for me to ‘get my voice back’ on my blog. That’s the longest swim I’ve done in years, and it made for a very powerful learning (and blogging) experience! In terms of the swim and getting your voice back — totally understand because there is so much pressure on administrators to be careful of what they say. Great that you got your voice back! Though unnecessary, thank you for the explanation. I loved the guide – thought it was great! On a more serious note, THANK YOU SO VERY MUCH for all the time you have taken to support such a large number of bloggers. I have most definitely been inspired by you web presence and your helpful suggestions. @cm have you ever meet some one that has the unfortunate luck in life of there not being that many photos of her that look any good? You have now 🙂 There are only a few photos of me that are any good. So I have a limited selection to choose from. This photo does get some debate but the next option is the comment avatar I asm using which also isn’t that great. In terms of what I am holding. As a well known chocoholic that is a block of Cadbury’s chocolate and a bottle of Coca Cola. The reason for the smile is they are consider the secret ingredients that keep me going the long hours — and my girlfirend had turned up at an event to bring them to me to help me get through the day. Thanks for your nice words regarding my support and glad what I do helps. Sue, you’re right. Reading this story behind the awesome Twitterholic post made it even better! I did follow the #itse10 this summer. Got to learn a lot even though I couldn’t be there. I also enjoyed your tweets- from #itse10 to your quest for good American chocolate. Thanks Kathryn. Glad you liked the story behind the post! And you will be pleased to know that I did find some nice chocolate — which didn’t survive long! In this time of competition, the IT field is growing to peak. There is a big need of IT institute services. I’ve just started to understand the meaning of this quote. Once you start to tweet, there’s a turning point in your life. Microblogging services open up a whole world of opportunities not only to share relevant information and updates but also to interact with people who you might have common interests with. I couldn’t agree more. I’ve pointed out to this elsewhere: I’ve got the impression that what makes learning possible at all is the human element in the connexions. Finally, “using it like a big teachers lunch room that’s open 24/7″ means basically the same as Juan Fernandez‘s metaphor. He said that for him, Twitter was like a staff room. Here you can also see this question of connexions established by people for people. Sue, I don’t seem to have enough of your posts Thanks for making me think so much. Glad my posts make you reflect and think! That is always a good thing. It is funny how sometimes you have an AHA moment and a post comes to you that you have to write – like this Twitteraholic post.